6′ 10″ x 21 1/2″ x 2 3/4″. I wanted a pure, fun, simple, surfboard to enjoy. Not the baddest, raddest, hottest, sickest or any other such go hard number. Just easy paddling, flowing, and with enough lift and glide to make it through flat sections long board style but without being a longboard. A board to enjoy that demands neither perfect positioning nor the cleanest, fastest of waves in order to be fun. Construction is glass/paulownia wood/glass sandwich over an EPS core with carbon over carbon/dyneema rails effectively making the rails parabolic stringers. A Goretex vent is fitted so the board “breathes” automatically with temperature changes and the leash is through connected into the fin box retro style. The small logo is burn branded discreetly. 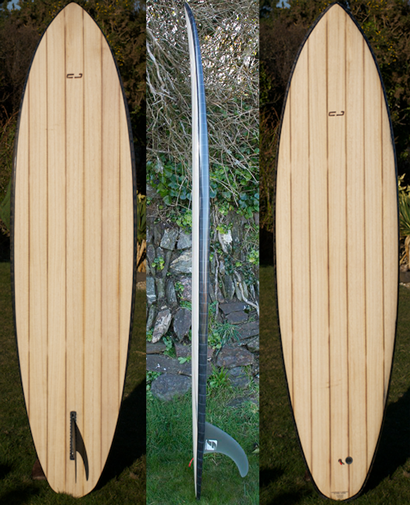 The board is very strong, very light, a lot of fun and imbued with the natural beauty of wood and carbon fibre. Sweet!